The year was late 1940s. 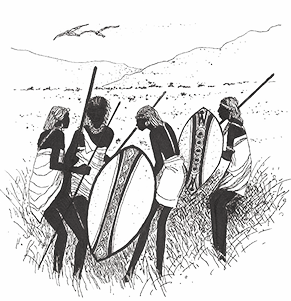 Against the backdrop of World War II, sections of the East African King’s Rifles forces were fast losing interest in their weaponry. A few started talking and soon after it emerged that, some shared a passion for musical instruments. 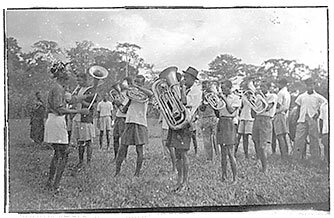 This fact fired up individual enthusiasm as the Kenyan, Ugandan & Tanzanian foot soldiers opted to pool their collective skills, giving rise to a makeshift ‘army band’. Their ostensibly inconsequential decision inadvertently laid the blocks for an informal ‘entertainment’ scene, which sprouted over months within confines of the barracks. Occasional gigs staged infrequently, improvised the back of army trucks as a podium or platform. 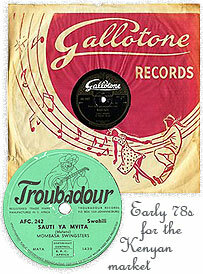 After the call of duty wound up, the excited returnee soldiers brought back fascinating ‘treasures’ home – an odd accordion, guitar or the gramophone. 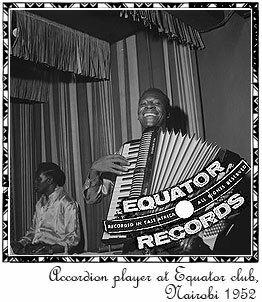 These came in handy during song and dance activities, which were organized clandestinely as the early 50s state of emergency restrictions took effect in Kenya. The gigs stirred an occasional sparkle, lighting up the liberation struggle’s gloomy years. In addition, indigenous communities did not entirely get detached from their cultural roots. 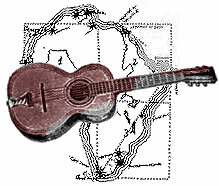 The sporadic engagements were a subtle strategy to stem the sweeping tide of secular, foreign songs, quietly infiltrating the pre-independence, traditional-based musical circles. This hive of activity did spawn seeds of creativity among the first generation, pioneer musicians. Fundi Konde, Silas Gwada, Ben Nicolas, Rosa Gwada, Esther Nicolas, Daniel Katuga, Paul Mazera Mwachupa, Wilson Laboso and Shinda Gikombe. 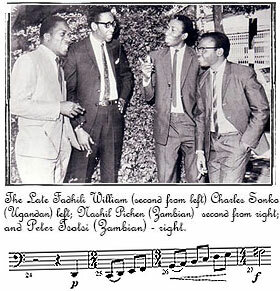 They would later on collaborate with visiting artistes /bands from Uganda, Tanzania, Zambiaor formerly Zaire such as Jean Bosco Mwenda and Edward Masengo – both who notably enriched the local musical stew. A younger generation of music makers who gradually also rose to prominence included Zambians Nashil Pichen & Peter Tsotsi Juma, Fadhili Williams Mdawida, Daudi Kabaka, David Amunga, Isaiah Mwinamo Asibera, John Nzenze, Mathews Mulumba and George Agande – all still regarded as Kenya’s unsung music icons. 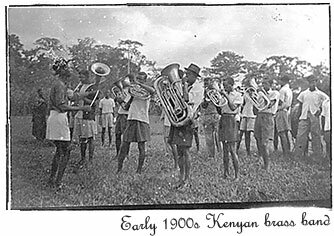 The veterans earned Kenya a distinctive reputation as East and Central Africa’s prime musical ‘Mecca’. They set standards, skilfully recording their best songs from 1950s to the late 70s. Their lyrical, rhythmic and instrumental arrangements were simple and catchy. Ironically, the bulk of these now mostly out-of-print classics, did not quite amount to tangible emoluments. Back then, pursuit of musical careers was a selfless, labour of love driven by passion and not necessarily motivated by commercial gain. In the long haul, most of their hit songs’ token returns proved costly. The pioneers sunset years fizzled past, spent in misery and want, despite being credited glowing legacies and illustrious recording stints. Compositions from their era remain timeless and unmatched in artistic ingenuity hence unknown to new, potential buyers or collectors. Handful outlets in Nairobi’s downtown stock possibly bootleg copies of the hard-to-find, prized recordings in varied formats. It may just be possible the veterans are enjoying the last laugh – as renewed appeal and interest in the evergreen oldies appears to pick up renewed tempo.